Crunch Away Cravings with our NEW Whey Thins! Snacks are integral to the Isagenix system on both Shake Days and Cleanse Days*. When those inevitable snack cravings hit, we want to ensure you’re equipped with a range of options to choose from to keep you satisfied without impeding on your goals. 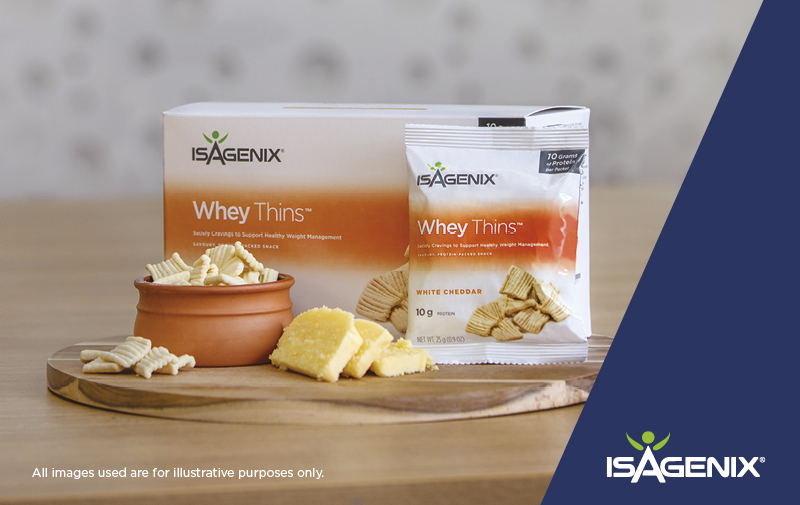 With that in mind, we’re thrilled to announce our NEW addition to the Isagenix Europe product family – Whey Thins™! Available in mouth-watering white cheddar flavour, these deliciously crunchy snacks pack a serious protein punch, with 10 grams of high-quality undenatured whey protein per serving to help keep you feeling full until your next meal. Even better, Whey Thins are gluten-free and at only 100-calories per individual pack, these savoury snacks are approved for Cleanse Days*. Does it get any better than that? These crunchy snacks can help support weight loss and muscle building† because they are packed with a combination of protein, healthy fats, and carbohydrates. Whey Thins in White Cheddar flavour are available NOW in your Back Office so add them to your Autoship today, and kick that crisp habit to the curb! †Protein contributes to a growth in muscle mass.